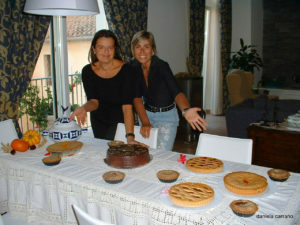 Off season is the best time to enjoy a cooking lesson in Amalfi. I would like to retrieve some old pastry recipes passed on generation but still living today. We have never forgotten the afternoon snack made by our grannies! Sal, a young maître-patissier very expert in traditional home-made cakes, revealed us his secrets adding a good pinch of patience. In our cooking classes in Amalfi, the pasticciotto napoletano is a must, a smooth pastry wraps, a delicious stuffing of custard and black cherries. First make the pastry. Place in a bowl 250 g of sugar, 250 g of butter and lemon zests, a pinch of salt and mix. Then add 2 whole eggs and 1 egg yolk, mix again and then add 500 g of flour filtered before in one fell swoop. Now mix by hands very quickly. Shape into a ball, wrap in the cling film and place in the fridge for about 30 mins. Meanwhile make custard: while the half liter of milk with vanilla are boiling, mix 100 g of flour, 200 g of sugar and 4 egg yolks in another pan, add hot milk slowly and mix gently. Cook over law flame until custard congeals. Add a drizzle of Strega liqueur and cover with cling film. Preheat the oven to 160 C.
On a lightly floured surface, roll out a bit more than an half of pastry to 5 mm thick and use to line the tin, then prick all over with a fork. Add the custard on the base of the pastry, then arrange a layer of 250 g of black cherries drained of their syrup. Roll out the remaining pastry and use to cover the tin. Pinch the pastry all over, prick with a fork and bake in the oven for 40-45 mins. Remove, leave to cool, decorate with icing sugar. If you want to cook the pasticciotto with us, and many other recipes, contact us to get all the information about the cooking classes we organize on the Amalfi Coast.